BITS is a new generation Institute and a rare creation of MPCT in a new ripple of educational feats and excellence in India and abroad. In its chain of achievements, the Trust has started two Polytechnics one at Sarsa-Ghogra, Bhiwani, another at Paluwas (Maham Road), Bhiwani, B.Ed. College for Women in the year 2006 at Paluwas (Maham Road), Bhiwani. BITS International School, Bhiwani has also been started by the trust recently. Further, it plans to add new feathers of BITS Dental College and BITS College of Pharmacy, Bhiwani to impart Medical and Pharmacy at their door-step. ITS located about 80 kms. from Delhi Boarder, 34 Kms. from Rohtak and 10 Kms from Bhiwani on Bhiwani-Rohtak main highway. 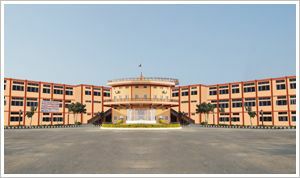 The campus has been developed in an area of 100 acres in the scenic surrounding with well-developed computer centers, workshop, laboratories, classrooms, library, hostels, captive, power generator, playground banking and medical and telephonic facilities etc. all effort are being made to keep the students in good health and confort in an atmosphere chongenial to studies.